One of our favorite lampworkers is the lovely Kari Russell-Pool. 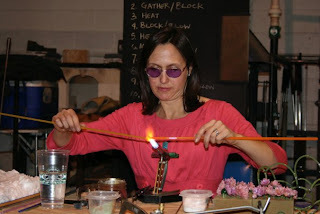 Kari and her husband Marc Petrovic were here at DC Glass Works earlier in the year. 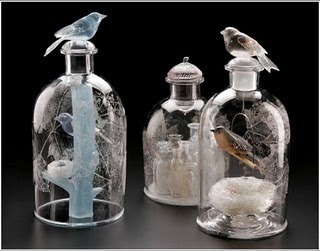 The Connecticut-based glass artist is in Tacoma, Washington as part of the Museum of Glass’ Visiting Artist Series, in partnership with Pilchuck Glass School. The MOG has a has an interview with Kari online – Click HERE to jump to MOG’s website. 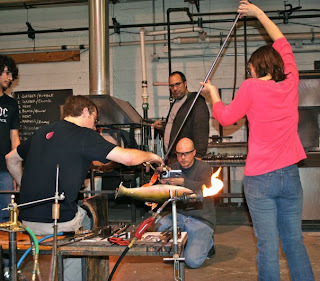 The James Renwick Alliance hosted the demo at DC Glassworks. The dynamic duo that is Kari Russell-Pool and Marc Petrovic worked their magic this past weekend, giving demonstrations of their intensely beautiful glass techniques, and illustrated how the two artists work with and inspire each other. 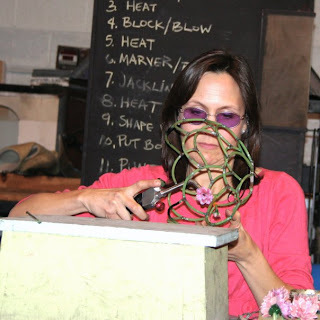 Performing the demos at DC GlassWorks, and talking at the Smithsonian’s Renwick Gallery, the husband and wife artists are the Nick and Nora of glass. Marc dazzled the audience with his incredibly detailed and stunning blowing abilities, creating a life sized striped bass that seemed to be stopped in midair leap and one of his famous birds. 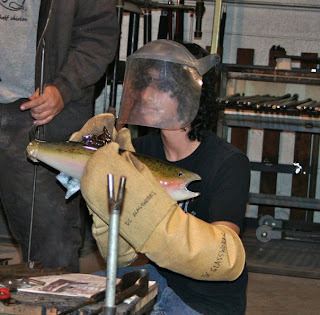 Catching the fish with fireproof gear. Kari made a number of her delicate lampworked flowers and showed how she creates the lace-like forms in glass. Marc watches Kari assemble a flower. 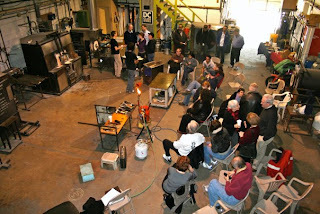 A big thank you to the JRA for organizing the talk and show, and to DC GlassWorks for hosting the demos. 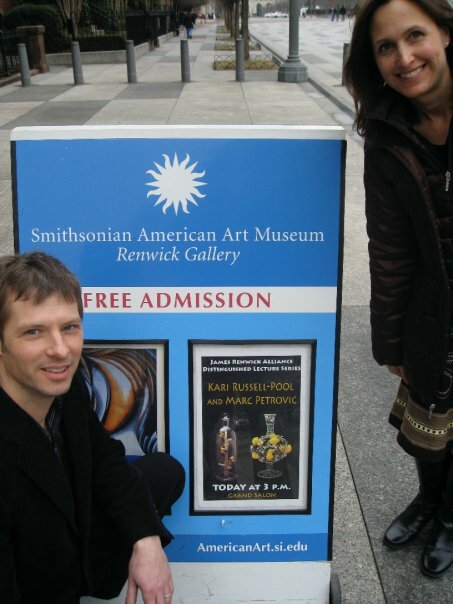 >The husband-wife artist team of Marc Petrovic and Kari Russell-Pool will be featured as the first JRA Distinguished Artist Program for 2010, with a day long demo on Saturday January 23 and a talk at the Smithsonian’s Grand Salon at the Rewnwick Gallery on Sunday, January 24. 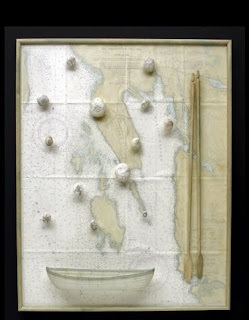 Kari Russell-Pool and Marc Petrovic have been working as studio artists since their graduation from the Cleveland Institute of Art in, respectively, 1990, and 1991. Marc makes pieces that are predominantly glass but also contain wood and metal components. Kari is primarily a flame worker. She creates form from pattern with a technique she developed on her own. 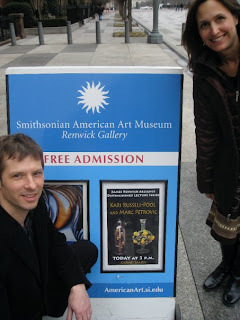 Although Marc and Kari strive to retain their individual work and approach, they have collaborated, to a greater or lesser extent, since college. Each offers insight and suggestions on the other’s work. The collaboration between the two artists most often incorporates Marc’s blown birds into Kari’s structures. 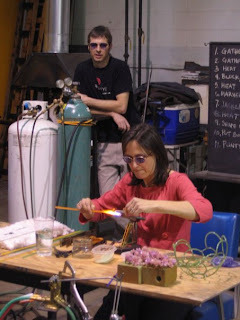 In an unusual approach to flame working, Kari melts and pulls all her glass rods from the same glass furnace that Marc uses to sculpt his components. 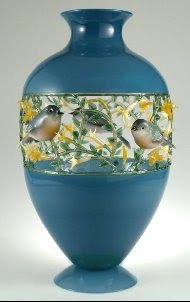 This allows for compatibility between the blown glass birds and the flame-worked structures. 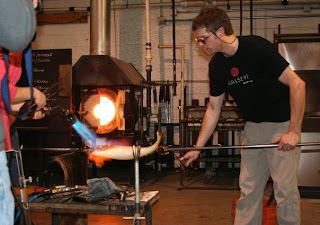 Flame workers seldom use soft glass in large-scale work. This glass does not take the stress of torch work well but does allow a greater range of color variation as well as the unique ability to be fused with furnace-blown components. 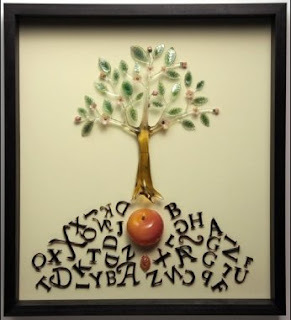 Both have taught at the Penland School of Crafts and The Studio at Corning, and have conducted numerous workshops both at home and abroad. The James Renwick Alliance will host the two artists in a demo on Saturday, Jan. 23rd from 10 am to 3 pm, held at our sister school location, DC Glassworks. The cost is $55 payable to the James Renwick Alliance. Click HERE for more info about the demo and tickets from the JRA. Click HERE for more info about the James Renwick Alliance. Click HERE for info about the Smithsonian Renwick Gallery calendar of events (scroll down for talk details).